So everyone knows backgammon, played with 2 dice. But who knows and enjoys SassanGammon, the variation played with 3 dice? One die is rolled by each player for the toss. The winner of the toss plays the opening roll. From there onwards, a player rolls with 3 dice and his opponent takes away 1 die, leaving him the 2 others to play. 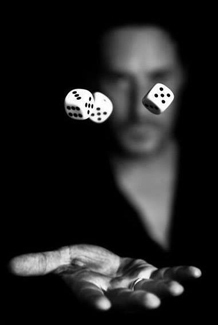 Exception: When a player has a checker or more on the bar, he rolls with 2 dice and plays them. Try it, you´ll love it ! 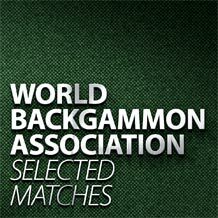 We have recorded 5 matches, including the final match. You can download them as .txt files and analyze them with ExtremeGammon or GNU or Snowie. Many thanks to Fuat Erdag and Yancho Hristov for providing the files. Enjoy the study ! The most international competition in Germany was back in Munich. Over 15 nations were represented at the 2nd German Masters to compete for points, qualification and victory at the last stop of the European backgammon Tour 2013. Charis Christidis from Greece came in victorious over Petri Pietilä from Finland, who has started in an incredible way and seemed for long time to be unstoppable. Christidis had to play and beat Pietilä twice in a row at the end to take the victory. Congratulations also to thrid place, Götz Hildsberg from Germany, who made his appearance back on the tournament scene, as well as 4th place, Michel Lamote from Belgium. The winner of the Leisure Group was Laurence Sinitzky from France. Her first attendance beyond the Novice Group led to her first victory over second place, Airat Mitchin from Russia. The number of breaks during a match has been changed. Breaks are now added to the time bank of each player when a clock is in use. Clocks are NOT to be stopped during the breaks and the time will be running on the player on break. Please check General Rules section for the updates.